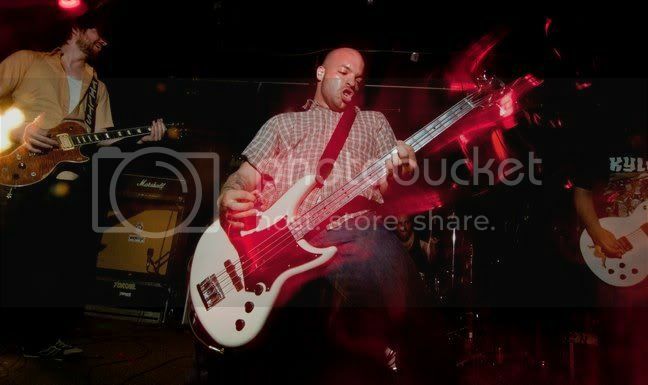 TORCHE is one of the few bands that we've been alongside for the entire ride, from inception up to present activity. We love this band, they are seriously awesome dudes who write seriously catchy, heavy music. It always feels good to post updates in regards to TORCHE and today we're happy to announce their two full-length albums have been newly re-pressed on vinyl. 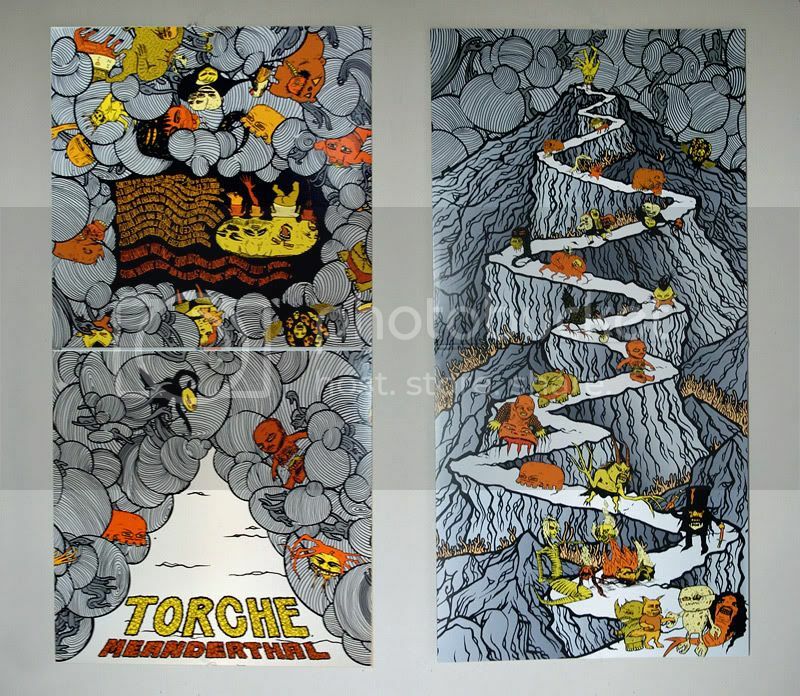 Meanderthal is the album that took TORCHE from the underground to the semi-aboveground. It was on many best-of lists in 2008 (including the #1 spot in the fantastic Decibel Magazine). As it turned out, this ended up being their final album with 2nd guitarist Juan Montoya* and the end of the first era of the band. We ultimately outdid ourselves (and many others) with the first layout/packaging for this thing, with two die-cut tri-folding LP jackets attached together.... and while we would've loved to keep it in print that way, it just wasn't financially feasible. So in an effort to keep one of our favorite albums in print, a new and somewhat simplified version of Meanderthal has been newly re-pressed. Now packaged in a standalone gatefold jacket, Montoya and Aaron Turner's original artwork has been mostly kept intact, and overall it still looks pretty damn killer (photo proof). We're glad there was a way to keep this album in print, as it truly is stellar! 2000 more of this have been pressed, with standard black vinyl available along with three "color in color" versions of oranges, silvers and yellows, as well as a red/white/blue tri-blend) . The ones photographed above compliment the layout quite well, and we're happy to announce that this is now available again in the Robotic Empire - Online Store. In addition to Meanderthal finally being available on vinyl again, we're now up to the fifth(!) pressing of the Self-Titled Reissue debut LP. This time around we kept the color vinyl (relatively) simple for a change and went with a Jah-inspired rasta tri-blend! 1000 more copies for this pressing (500 black, 500 rasta jawns), also available now in the Robotic Empire - Online Store. All of this recent TORCHE activity is culminating just in time for a massive summer tour (dates below), hot on the heels of guitarist/vocalist Steve Brooks "other" band FLOOR just completing their first proper US tour in eight years! We recently re-pressed the FLOOR Below & Beyond discography 8xCD set for their tour and still have some copies in stock. Seeing as how the band may be (relatively) dormant for a while with TORCHE getting busy again, we've just discounted the 8xCD FLOOR set to $29.99 , which can be found now in the Robotic Empire - Online Store. We also have a slew of classic FLOOR t-shirts available and are now down to the last half dozen (or less) copies of the ultramega 10xLP, 1x7", 8xCD, 32-page-booklet deluxe vinyl edition... Seriously: last chance to dance on that beaut! * Juan Montoya is now playing in MONSTRO, who recently signed to Vagrant (wtf?) and are going on tour with KYUSS and THE SWORD in September/October. Congrats Juan! ** Andrew Elstner was in the criminally underrated RIDDLE OF STEEL and is simultaneously now in the also criminally underrated TILTS. Check them out ASAP. In addition to all the TORCHE related news, we have also expanded our already outlandish store-wide sales! For the rest of the month, 99% of the 7" EPs we carry are reduced further to only $1.99 apiece. That now matches our store-wide CD sale of just $1.99 per CD, CD-R, 3"miniCD, etc, etc etc. We got a little crazy there, but are only remaining this insane until the end of the month as we've actually cleared a good amount of much-needed space. Still lots of great items available at dirt cheap prices (including newly discounted CANNABIS CORPSE sweatpants), please check out the Robotic Empire - Online Store for all of our ridiculous discounts. We've also got a meaty update as far as new items & restocks go! 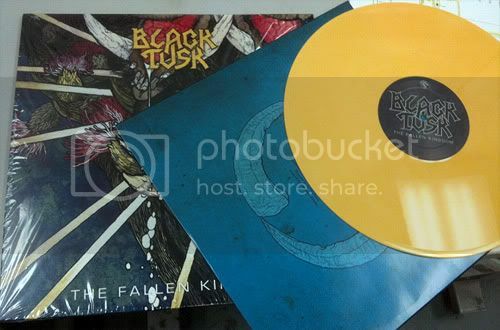 One big score this time around is the original BLACK TUSK demo EP, The Fallen Kingdom, finally pressed to wax by our homies at Hyperrealist. Eight songs, badass Baizley artworkin, raw sludgey goodness as only the dirty South knows how to properly do... and oh yeah, some logo-matched yellow vinyl copies too if you're quick! Chop chop. In addition to that jammer, we've got new stock from ANNIHILATION TIME (the II LP reissue with limited bonus 7"), CAPSULE's righteous new No Ghost album on ltd color vinyl, CHURCH OF MISERY and EYEHATEGOD essentials from Emetic, the unstoppable FELL VOICES LP from Gilead brethren, horribly difficult to obtain Throne imports (FLESHPRESS, LUDICRA, UNEARTHLY TRANCE), lotsa skramz (DANSE MACABRE, DOLCIM, HER BREATH ON GLASS, etc) for all the screamos out there, KICKING SPIT's awesome debut 12", PYGMY LUSH's unbearably good Old Friends album on import wax (with slightly different artwork), and heaps more killer stuff. Not a bad update after a slight gap there, hopefully something caught your eye and you're keen to hit the Robotic Empire - Online Store. Last but not least, a quick update on a few current projects: both THOU and PG.99 will see new vinyl on Robotic Empire in early August! We've got a "megaEP" for THOU at the plants now titled The Archer & The Owle, and while we may obviously be biased, it absolutely rules! The PG.99 release is the long-overdue vinyl treatment of their Singles collection, along with a repress of the Document #8 album, both to coincide with their (now sold out) pending reunion at Best Friends Day in Richmond this August. We're hoping to have those for sale sometime in July or August, depending on when things wrap up. That's it for now, please hit up the Robotic Empire - Online Store if you can! Peace! Our southern sludge brothers THOU are about to embark on a journey to the ancestral lands... in other words, Europe: watch out! Shortly upon their return we'll have a substantial new release from these burly boys titled The Archer & The Owle. More info forthcoming, but in the meantime... check out these fiends in action if you live on that side of the pond!